Early NZ lithograph "L'Astrolabe in French Pass"
Within the range of early New Zealand prints, there are no better or more significant French prints than those published after two voyages of L'Astrolabe under the command of Dumont D'Urville. His records are as important in their way as Cook's, and the prints published in the Atlas to each voyage are among the finest New Zealand prints. Published at a time when French lithography was at its peak, they are superb examples of both artistic and accurate recording and the highest technical proficiency in drawing on stone. Originally published in black-and-white, many plates are now found hand-coloured, and it is believed some volumes were coloured for the publisher. Dumont D'Urville was an extraordinarily talented man, with a wide range of interests. He had entered the French Navy in 1807 as a midshipman, and passed his examinations in navigation and mathematics to gain first place among 72 successful candidates. Simultaneously, for his own interest, he was studying Greek, Latin, and Hebrew, to which he would later add Spanish and Italian. His other great love was botany, and after an application to join Freycinet on Uranie was unsuccessful, he spent all available time studying botany and amassing a very large and important collection of plants. In 1820 Dumont D'Urville sailed on his first voyage, a nine-month cruise in the eastern Mediterranean and the Black Sea as an assistant in hydrographical research. He was present at Melos when the Venus de Milo was discovered, and it was through his influence that the statue was purchased for the Louvre. The following year, promoted to Lieutenant, Dumont D'Urville at last set sail for the Pacific, with Duperrey aboard Coquille. The events of the period of almost three years that Coquille was away from France left a profound impression on Dumont D'Urville, and he could scarcely wait for his next chance to go to the South Seas. In addition to his duties as executive officer, he had been responsible for the zoological and botanical records, and later published accounts on these subjects earned him high praise. Promoted to the rank of Commander in November, 1825, and commissioned to Coquille the following month, Dumont D'Urville began the long preparations for his own great scientific voyage. His instructions were to sail via the Canary Islands, round Cape Horn, to visit Australia and New Zealand before exploring further in the South Pacific, and to return to France via the Indian Ocean and the Cape of Good Hope. Even the dates for the various stages of the voyage were prescribed, though they were to prove very difficult to maintain. Coquille was renamed L'Astrolabe for the voyage, and sailed in April 1826. Among those aboard were Lesson, the botanist, Barthelemy Lauvergne, Dumont D'Urville's secretary, whose artistic talent was pressed into service to record many zoological specimens; and young Louis Auguste de Sainson, the expedition's official artist, who was later to become a permanent clerk to the Admiralty. L'Astrolabe spent almost three months on the New Zealand coast, moving from the north of the South Island up the entire east coast of the North Island. The expedition members were tireless in their recording: a report published after their return to Paris states (of the whole cruise): "There are a great many drawings designed to show the character of places, the types of men living in them, their costumes, arms, dwellings, etc. : eight hundred and sixty in all. We owe them to M.de Sainson. If. . . we add four hundred views of the coast drawn by M. Lauvergne, the total number . . . will reach twelve hundred and sixty-six . . . [there is also a] fine collection of portraits of the natives which comprises one hundred and fifty-three figures . . . this collection calls for special attention . . ."
From New Zealand L'Astrolabe went to New Guinea and in February 1828 to Vanikoro, where the remains of La Perouse's ships were definitely identified. L'Astrolabe returned to France in March 1829. Dumont D'Urville's pride and pleasure in the accomplishments of his expedition turned to dismay and bitterness when the Admiralty refused any recognition of the work of his officers and men: indeed, he charged the Admiralty with "indifference" and could not accept their lack of interest and support. Over the next four years Dumont D'Urville himself wrote the entire text of the five volumes of narrative of the voyage of L'Astrolabe, and in 1835 saw the completion of publication of the whole account — twelve volumes of text and five albums. The Atlas included 32 superb New Zealand views. Dumont D'Urville's third Pacific voyage began in September 1837 when L'Astrolabe, in company La Zelee, sailed from Toulon. He was 47 years old, and the new expedition was both hazardous and arduous: these ships were to explore the South Polar region. L'Astrolabe and La Zelee spent the months from January to March 1838 exploring in the Antarctic, discovering and naming Louis Philippe Land in honour of the King, and drawing many maps and charts which were forwarded from Valparaiso in May. 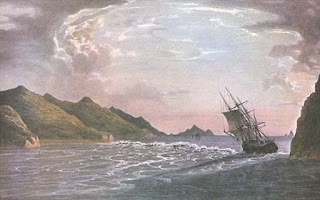 The period to December 1839 was spent among the Pacific islands, but in January 1840, Dumont D'Urville took his ships south again into the ice, and the names of Adelie Land (for his wife) and the Clarie Coast (for the wife of Captain Jacquinot of La Zelee) were among those added to the polar maps. From March to May 1840 Dumont D'Urville revisited New Zealand, approaching from the south and passing Stewart Island before again sailing up the east coast. The artist on this occasion was Louis Le Breton, a surgeon and naturalist, and gifted painter who was later to exhibit at the Paris Salon. L'Astrolabe and La Zelee returned to Toulon in November 1840, and this time Dumont D'Urville had no cause to complain of "indifference". He was awarded the Gold Medal of the Geographical Society, and was promoted to Rear-Admiral, while his officers and men received awards from the King. For the next two years Dumont D'Urville worked on the preparation and publication of the account of the voyage, and two volumes had appeared when, in May 1842, he, his wife, and their only child, were burned to death in a disastrous train wreck. The third volume of Voyage au Pole Sud was written by the expedition's geographer, Vincendon-Dumoulin. One of the prints included in this volume was “Entry to the Bay of Islands New Zealand” that has been republished by Thorndon Fine Prints. 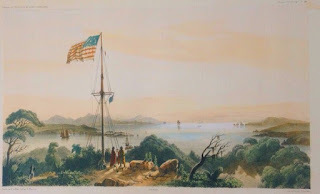 This shows the American flag of the time flying from the flagstaff later made famous by Hone Heke on Flagstaff Hill near Russell and is now available for sale online here.